The Altitude 3 click is here, designed for perfect high-resolution barometric pressure measurement. It has the integrated barometric pressure and temperature sensor – ICP-10100 based on the advanced MEMS capacitive sensing technology. The Click board™ offers an industry-level accuracy and thermal stability. An absolute pressure accuracy of up to ±1 Pa enables the Altitude 3 click to sense some very slight altitude changes, even within the range of less than 8.5 cm. The temperature sensor offers the accuracy of up to ±0.4°C, ranging from -40°C to 85°C. The Click board’s low power requirements make it a perfect choice for various battery-operated applications. 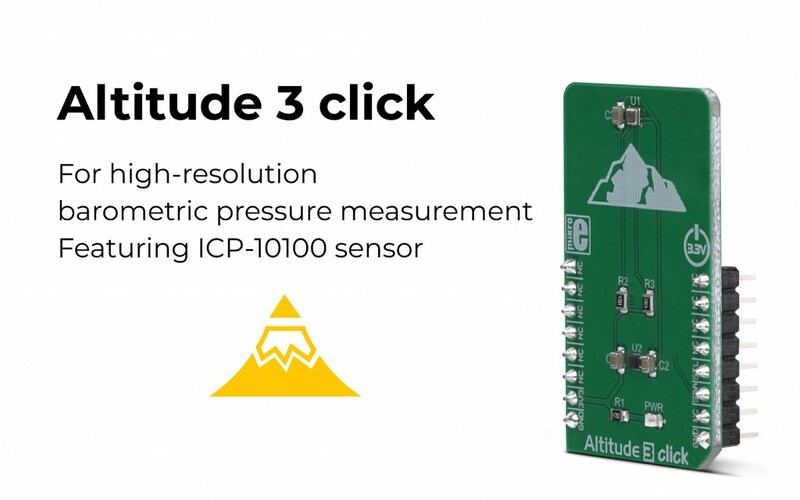 The Altitude 3 click will be a perfect choice for development of various applications based on barometric pressure sensing. Some of these include activity identification, mobile indoor/outdoor navigation, altitude-hold for drones, and others. For more information about the Altitude 3 click, please visit our website.